While the rest of Singapore took time off this weekend, Singaporean C-130 pilots, navigators and airmen from the Air Combat Command's Transport Group were hard at work ferrying earthquake survivors and relief supplies in New Zealand. 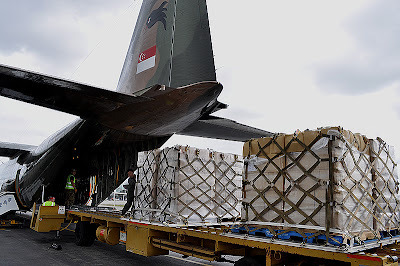 The current Republic of Singapore Air Force (RSAF) deployment in support of NZ-led quake relief operations is the Singapore air force's largest and longest range deployment since the 2004 Boxing Day tsunami. To get to New Zealand, RSAF C-130 pilots and airmen flew a single distance trip of around 8,400km from Paya Lebar Air Base (WSAP) to Christchurch (CHC). The C-130s took off from WSAP on Wednesday morning just after 0400hrs Hotel. Their flight would not have been possible without the RSAF ground support elements who loaded, fuelled and prepared the C-130s for their long flight. RSAF navigators were also instrumental in shepherding the pair of turboprop transports across the vast Australian continent. The flight took them from Paya Lebar Air Base to RAAF Darwin, then to RAAF Richmond and across the Tasman Sea to New Zealand. The contribution of the RSAF Air Movement Centre (AMC) and Ministry of Defence (MINDEF) Foreign Military Liaison Branch in arranging flight clearances is also acknowledged. The RSAF contribution was spearheaded by a KC-135R tanker/transport from 112 Squadron. Early on Wednesday morning, 112 Sqn pilots and airmen flew a KC-135R tanker/transport to Christchurch for quake relief work. A jet-powered sibling of the Boeing 707 airliner, the KC-135R flies faster than the propellor-driven C-130 transports. The KC-135R was thus tasked to fly as pathfinder with the advance party for Singapore's earthquake relief team, which the government of New Zealand accepted for the NZ-led relief operation in South Island's largest city. The team comprises SAF and Singapore Civil Defence Force rescuers. RSAF C-130s from 122 Squadron are no strangers to New Zealand skies, having participated in the Sky Train series of tactical airlift exercises with the Royal New Zealand Air Force (RNZAF). From time to time, the RNZAF also despatches aircraft to Singapore for war games held under the auspices of the Five Power Defence Arrangements (FPDA). Well done, 112 Squadron and 122 Squadron. Fly safe. 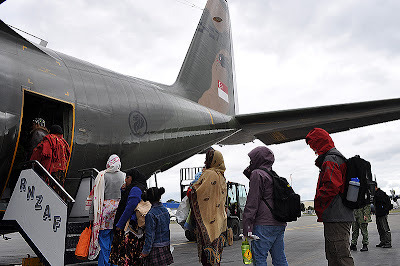 Over the weekend, two Republic of Singapore Air Force (RSAF) C-130 military transport aircraft, which arrived in Christchurch on 24 Feb 2011, were dispatched to assist the New Zealand Defence Force (NZDF) to airlift humanitarian aid and supplies to victims of the earthquake. The aircraft have made two supply runs to transport bottled water and welfare supplies, as well as a decontamination team and equipment into Christchurch. The aircraft also evacuated 138 civilians out of Christchurch to Wellington and Auckland. The SAF has made available the two C-130s currently based out of Whenuapai Air Base near Auckland for use by the NZDF as part of the ongoing assistance provided by the SAF for the disaster relief efforts in Christchurch, New Zealand. This morning, the NZDF Chief of Defence Force Lieutenant-General (LG) Richard Rhys Jones visited the SAF team and expressed his appreciation for the SAF's contributions to the rescue operations and disaster relief efforts thus far. Singapore Contingent Commander Colonel Melvyn Ong, who met with LG Jones, said, "The Singapore contingent remains committed to assisting the NZDF with rescue operations and to provide humanitarian aid to the residents whose lives and homes have been affected by the earthquake. We hope that our assistance has gone some way towards relieving the suffering of the earthquake victims." Since Friday, two medical officers from the SAF team were deployed with the NZDF mobile primary healthcare team to welfare centres in Christchurch where they provided medical assistance to civilians affected by the earthquake. The 116-strong SAF team continues to be deployed to help the NZDF with cordon operations to ensure the safety and security of the residents whose lives and homes have been affected by the earthquake. Why don't you just say that the KC-135s are jet-powered siblings of the 707 ? A lot more people would understand that than "turbofan".